“Kräusening” is the process of adding a proportion of active wort to cellar tanks containing fully-fermented beer. The term “kräusen” refers to wort when it is at its most active state of fermentation. A kräusen brew on the way down to the cellar. In the finishing of lager, this technique uses active wort that is halfway through its fermentation cycle and makes up approximately 15% to 20% of the volume of the tank. Kräusening was originally developed as a method of initiating a slow secondary fermentation that would reduce the level of undesirable flavor components and produce a cleaner tasting beer. This secondary fermentation could take as long as three or four weeks, which was the standard aging period for most lagers. When kräusened in an enclosed tank, beer becomes naturally carbonated as well. At Anchor Brewing, we kräusen our Anchor Steam Beer, for many of the same reasons, but primarily for the purpose of carbonation. 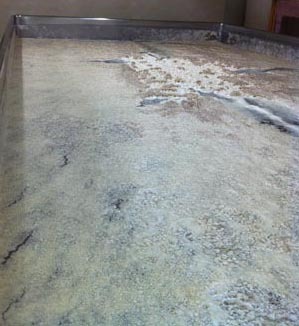 Since our primary fermentation takes place in open vessels, all of the CO2 created by the yeast is lost. Kräusening generates enough CO2 to re-carbonate the entire tank of beer to the proper level, as well as producing a finer finished beer. How long is Anchor Steam kräusened for? A couple of weeks? Six? Two months? Thanks! Greetings, Hugo. Anchor Steam Beer is kräusened for two weeks, give or take a day or so depending on the production schedule. Thanks for commenting!